For the coffee lover in your life, this sophisticated arrangement makes an irresistible gift! Inside a modern basket, they'll discover a collection of robust gourmet coffees nestled among a bounty of decadent chocolate treats. Complete with tempting cookies, a bar of dark chocolate, and more, this exquisite gift is guaranteed to delight no matter the occasion. Exclusively from GourmetGiftBaskets.com! For the coffee lover in your life, this sophisticated arrangement makes an irresistible gift! Inside a modern basket, they'll discover a collection of robust gourmet coffees nestled among a bounty of decadent chocolate treats. Exclusively from GourmetGiftBaskets.com! Gourmet treats include 5 packets of gourmet coffees, tiramisu wafer cookies, white chocolate cranberry cookies, chocolate wafer bites, chocolate chip cookies, caramel chocolate chunk cookies, milk chocolate sea salt caramels, Belgian chocolates, vanilla wafer rolls, cookie thins, a Ghirardelli dark chocolate bar, peanut butter & chocolate dipped peanuts, and s'mores brittle crisp! 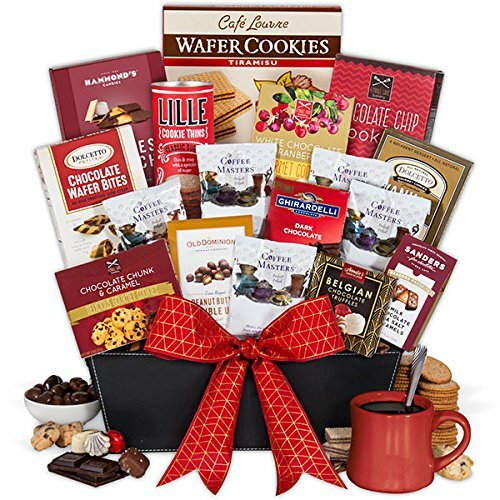 Keepsake basket with coffee & chocolate treats is professionally shrink wrapped with a festive ribbon.